Silly Matthew Falconer. All that screaming about how he's the best darn conservative candidate Orange County's ever seen must have cut off the oxygen to his brain...he forgot that conservatives usually support property rights. 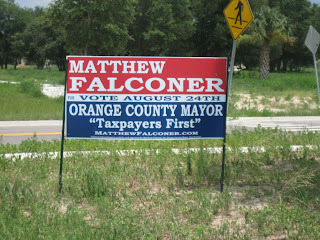 In the past few weeks, several Matt Falconer signs have popped up along highways all over Orange County. They are mostly in right-of-ways and construction areas. Seems like Falconer is trying to take advantage of the collapsed real estate market and the fact that owners may not be paying as much attention to their properties. In his typical obnoxious way, he wrongly assumes that he has the right to put up his signs anywhere he wants, based on some sort of magical privileged status endowed upon him as a candidate. Sorry, buddy, that's not how it works. Falconer, you arrogant twit. Let me explain how the law works, since you clearly don't get it. Political signs might be "free speech," but they are not exempt from local sign ordinances. In fact, the U.S. Supreme Court has specifically upheld sign restrictions passed by local governments, provided that the law in question is "content neutral." In other words, it's OK for a city to prohibit signs over a certain size, restrict the number of signs, regulate lights or other distracting aspects on signs along roads, etc. What would be unconstitutional would include prohibiting signs supporting Democratic candidates, signs criticizing the local government, signs advocating pro-life positions, etc. As an example, the City of Winter Park has an ordinance that restricts yard signs to no larger than 24" by 12". That's an odd size, it's smaller than most consultants prefer to order for yard signs, it requires an extra expenditure for Orange County candidates who want to put up signs in Winter Park yards, it's basically pretty darn annoying, but it is completely legal and constitutional. Regarding the Langley property, if the City of Oakland wants to restrict how many large signs can be erected on a parcel, they can, even if poor little Matty Falconer doesn't like it. Angie's property at Remington and 50 is currently listed for sale, and they already have a large sign advertising the parcel. Where Falconer placed his sign actually partially blocked the view of the for sale sign from one direction. If you were the owner, given the choice of being able to advertise the parcel to potential buyers driving down Highway 50, or to have a Matt Falconer sign put up without permission, what would you choose? Beyond the fact that the city's restrictions on signs are completely constitutional, property owners have the right to decide who can put up signs on their property! Matthew Falconer has absolutely no right to put up signs on someone's property without their permission. Displaying a political candidate's sign implies support or endorsement of that candidate and it's a violation of the property owner's free speech rights to try and force them to "speak" in support of candidate if they do not wish to do so. Falconer's First Amendment rights as a candidate do not dilute our rights as property owners to manage our own property or our free speech rights as private citizens. Angie waited several days and never got any further response from Falconer. Since he put up the sign on her property without permission (ahem, trespassing...) and then refused to remove it, it then became abandoned property. I was going to be in the area for another meeting just down the road and asked Angie if she wanted me to take down the sign. She said yes and told me I could keep the sign posts. After taking a few pictures, I did take down the sign. 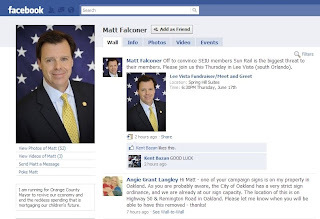 Special message to Matt Falconer: Matt, if you publicly apologize to Angie Langley for violating her property rights, and pledge to comply with city and county ordinances for the rest of your campaign, I'll give you the sign posts back. (The sign itself has been discarded, sorry!) Otherwise, I think they will make an excellent trellis for the fall vegetable garden I'm planning. Your deadline is 5:00 p.m. this Friday. If Matt Falconer has put up one of these signs on your property, you do have the legal right to remove it. If the sign was put up on your property without your permission, it's yours now. FYI, he is using metal street sign type posts and attaching the signs to the posts with zip ties. You can cut the zip ties with a regular pair of scissors. The sign itself is reinforced plastic but folds easily. The sign posts came up easily for me after I wiggled them back and forth but you may need a small shovel if they are in firmer soil. Make sure to take all pieces with you to reuse or dispose - there's no sense leaving it for him to pick up and reuse on someone else's property. Now what about all the signs Falconer has placed on right-of-ways and construction zones? If it's a private parcel and you know the owner, ask if they have endorsed Falconer. If not, tell them they don't have to leave up the sign and offer to take it down for them. If the sign is on a right-of-way, I've listed the contact information for some local code enforcement departments below. 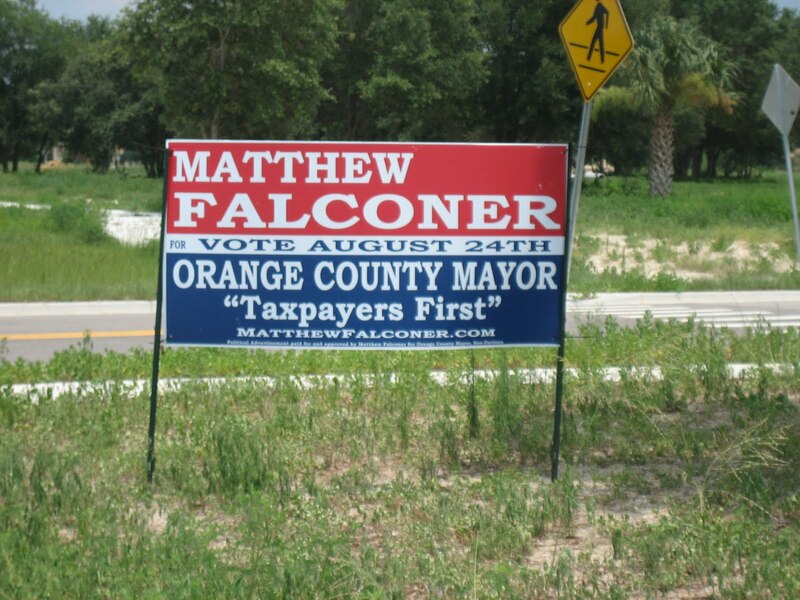 Call them or submit a complaint online and make sure to clearly identify the location, address, side of the street, and that it's a Matthew Falconer sign. They should be able to help. Most of our local code enforcement boards take an aggressive stance on signs illegally placed along our roads. 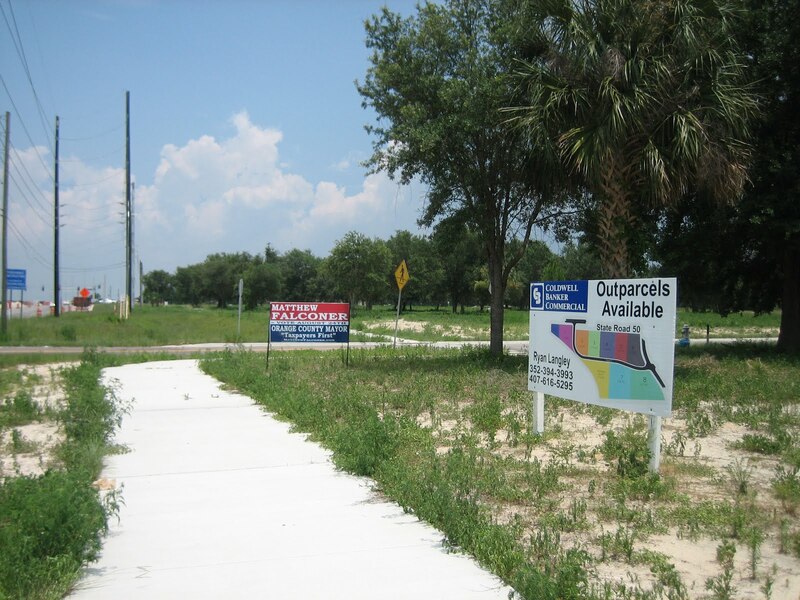 [Roadside/right-of-way signs] are illegal in almost every Central Florida municipality. In Oakland, however, these signs will be removed almost immediately after it is placed. Oakland Zoning Code §16.1.3 A states "any sign placed on public property, including rights-of-way," is prohibited...This provision of the Zoning Code is aggressively enforced, to protect workers that must scale utility poles (the nails and staples that are used to attach signs to poles are a safety hazard), prevent blight resulting from visual clutter, and preserve the town's unique and sensitive visual environment. ...signs are usually removed and disposed by Town staff within 24 hours of posting. "Taxpayers First," Matt? What about property owners? What about our local communities and their right to protect themselves from blight and visual clutter? Where do we rank in your view of the world? Maybe you should change your slogan to "Me First!" Well, apparently, Matty doesn't like paying his property taxes either. I guess we couldn't lump him into his "taxpayers first" mantra since he doesn't seem to pay them.